The Suan Son Pradiphat Beach, or Sea Pine Tree Garden in English, was so named because of the Casuarina trees lining its coast. On a sunny day, these trees provide a nice shade to its visitors, making the sandy beach a nice place for hangout. With an ocean breezy wind blowing, the stunning seascape to watch and the sound of the waves as they hit the coast, it also offers a relaxing environment that’s really hard to resist. 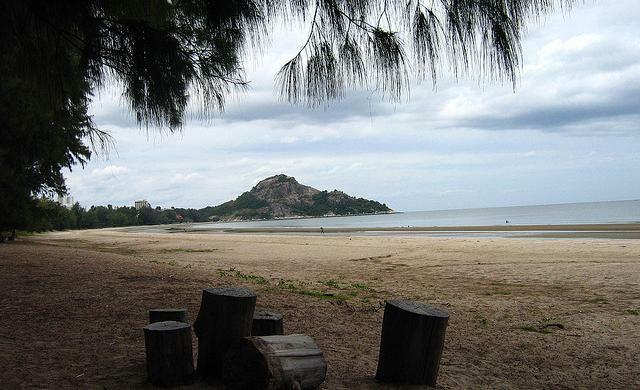 The beach is popular to many Hua Hin vacationers because of its proximity. Because of Hua Hin’s royal prestige, it tends to get crowded sometimes and its visitors are themselves visited by a desire to seek a quieter beach. Those looking for additional beach attractions they can go to while they’re in the area come to this beach to enjoy the sceneries and the peaceful surroundings. And even though there are plenty of restaurants about, the beach still maintains its serene environment. In addition, you can be sure of your security and protection while you’re within the vicinity, this place being a beach controlled and kept by the military. Besides the restaurants, there are also numerous hotels, cottages and self-catering bungalows available should you wish to stay and extend your visit. Otherwise, the beach is ideal for half-day picnics for families with small kids especially. It is easy to get to the Suan Son Pradiphat Beach. From Hua Hin, take Highway Number 4 or the Phetchkasem Road, go south for about 8 kilometers and turn left at Kilometer Marker 240 towards the beach road for roughly 500 meters. If you’re not driving, public transportation is also available. Take a minibus from Hua Hin at Chatchai Market. Choose the one going to “Suan Son”. If you’re coming from Bangkok, on the other hand, going to the Suan Son Pradiphat Beach is also possible. From Bangkok, take the train Number 251. The route is called Thonburi to Lang Suan. When you get to the railway station that says Suan Son Pradiphat, that’s when you’ll know you’ve arrived. It would be best to tell the driver where you plan to get off and ask help in case you miss it. Because the Suan Son Pradiphat Beach is separated from Hua Hin by Khao Takiab Beach, the Khao Takiab, in essence, blocks any noise coming from the rather numerous tourists in the more popular beach of Hua Hin. This and all the striking features of the beach itself make it an ideal getaway for couples looking for romantic setting, families who want to ensure the safety of their kids and even singles who want to escape the daily grind of their city life.